The very popular EaAU universal cone filters are available! 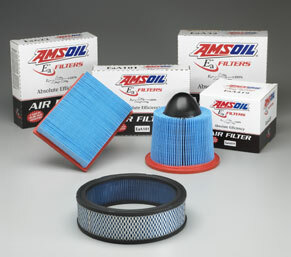 The introduction of AMSOIL Ea Air Filters represents a major breakthrough in filtration technology. For the first time, revolutionary nanofiber technology is available to the auto/light truck market. It&apos;s another first for AMSOIL! Nanofiber technology has been used exclusively in heavy duty applications, including the US ARMY Abrams M1 tank. 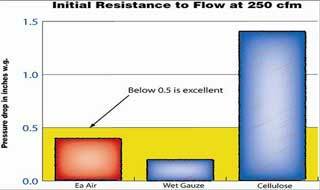 AMSOIL Ea Air Filters provide the absolute best filtration and with an unmatched 4-year/100,000-mile guarantee, AMSOIL Ea Air Filters save money! Click HERE to visit Amsoil's filtration website, and for more information about universal EaA filters that are replacements for popular aftermarket intake air filters like K&N, Injen, AFE, AIRAID or any custom application, head to the EaA Universal Air filter mini-site. 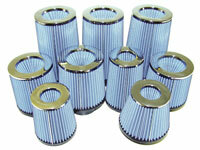 These universal filters are not being discontinued like the OEM fitments were. Nanofiber is a phrase generally referring to a fiber with a diameter less than one micron. Cellulose fibers, on the other hand, are larger than nanofibers and have larger spaces between the fibers, causing contaminants to load in the depth of the media and plug the airflow path, resulting in higher restriction and less capacity. 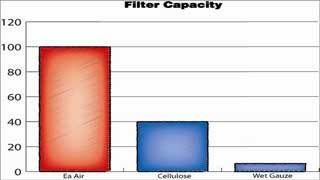 AMSOIL Ea Air filters incorporate a specially constructed cellulose media with exclusive synthetic nanofibers applied to the surface. Dust and submicron particles are trapped on the nanofiber surface, preventing them from lodging in the filter media depth. Here&apos;s how it works: Imagine two filtration media, a chain link fence and a mosquito net. Each is required to stop contaminants, in this case tennis balls. A tennis ball will fit quite nicely into an opening of a chain link fence, but will obstruct the hole almost 100 percent. Now, imagine a tennis ball covering a mosquito net. The tennis ball, at the point of contact with the netting, will obstruct much less filter area than the chain link fence example. In fact, air will flow around the tennis ball all the way to the point of contact. It will take many more particles to obstruct the netting surface area than the chain link fence.